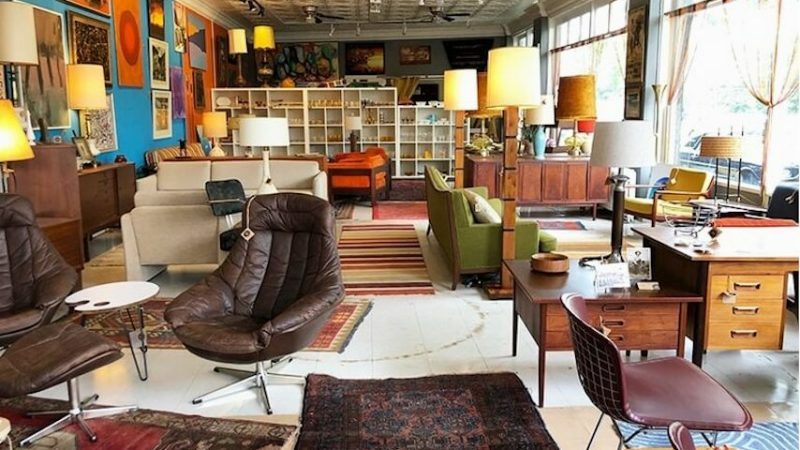 Stuff unpacks vintage treasures and retro goodies inside its uptown location. It started with a coffee table or, to be more precise, six coffee tables. Monik Geisel and Daniel Goodwin, proprietors of Stuff., Kingston’s new furnishings shop, sought the perfect coffee table for their home. Avid collectors, they tried a succession of salvaged mid-century modern tables and wound up with five more tables than they needed. “We looked at this collection and said, okay, maybe we should sell a couple of them,” says Geisel. Ridding their home of surplus tables led to selling retro furniture at markets, eventually setting up shop in Rosendale, and then moving that shop to uptown Kingston. The new shop — with its brilliant blue walls — is ideal for showcasing mid-century furniture in shades of burnt orange and new moss green. The walls are decorated with outsider art, which Goodwin describes as a little “weird around the margins,” or art that does not “follow the rules.” Comfortable arrangements of vintage couches and chairs make it easy to imagine visiting the set of a 60s sitcom or settling down to watch the 1969 moon landing. The couple has long enjoyed preserving the mid-century aesthetic. Geisel, also a photographer and painter, grew up installing cabinetry and repurposing discarded furniture with her carpenter father. Goodwin, a musician and music producer with a studio in Woodstock, is drawn to Scandinavian designs and any kind of modern minimalism. Beyond the aesthetic appeal, there’s also the durability of furniture designed to last a lifetime. “The 60s, even into the 70s, was the last time that people made things on a grand scale with a lot of care and attention to detail,” says Goodwin. Geisel says that it’s possible to find sturdy mid-century pieces for the same price as poorly made furniture from big box stores. It’s a better investment since poorly made furniture often falls apart in a few years and winds up in landfills. Because she finds it sad to see beautifully designed furniture in the garbage, Geisel does not like to charge too much for rehabbed pieces. Most of their finds require work, from simple adjustments such as tightening screws and oiling surfaces to completely repurposing pieces. For example, it’s possible to retrofit a credenza that previously stored china as a display case for antique cameras. Rehabbed credenzas are also a great surface on which to display flat screen TVs. Rescuing, rehabbing, and repurposing furniture is the perfect business for two people who enjoy tinkering. The couple were happy doing business in Rosendale, but, when the Kingston store became available, it seemed like fate. There’s certainly more foot traffic. At least once a week someone stops by to comment on the store’s name. Geisel recently saw someone walk by the store, look at the name, and suddenly stop. She replied that she did. He said he was just checking. When Geisel and Goodwin originally discussed a name for the store, they considered Stuff and Things. But they decided that Stuff — with a period at the end — was more appropriate. They salvaged the word “Things” for another possible store. Right now, they focus on mid-century modern furniture, art, rugs, and collectibles, but who knows what “things” might appeal to them in the future.